If you work with data in your organization and want to expand your role, or you're considering a career move into a data analytics or data science role, the University of Delaware's 100% online Master of Science in Applied Statistics (ASTAT) can help you succeed. Leverage your passion for digital analytics to earn an advanced degree in statistics and expand your career opportunities. Statistics skills are in high demand with companies from nearly every industry hoping to make their data actionable, investing in analytics and offering highly competitive salaries to attract skilled data professionals to meet this need. 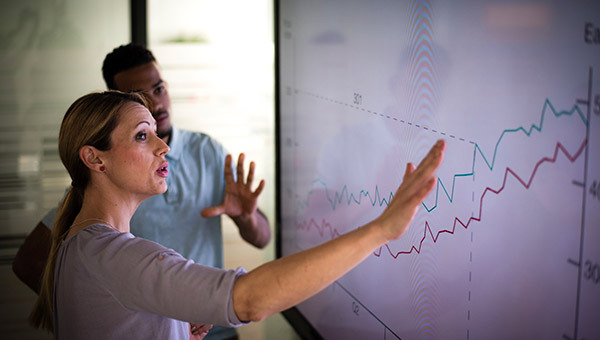 If you work with data in your organization and want to expand your role, or you're considering a career move into a data analytics or data science role, the University of Delaware's Master of Science in Applied Statistics (ASTAT) can help you succeed. 90% of students who graduate with a master's degree in statistics from UD's Department of Applied Economics and Statistics (APEC) find employment within six months. The flexible online format enables you to continue working while earning your degree and immediately apply what you learn to uncover insights for your organization.